Once upon a time, I had been invited to join my sister & her partner at Bishop’s for dinner. It was a lovely late spring day, and I was so excited to be going to one of my favourite chef’s restaurants. I had no idea just how much that visit would help me in understanding the true art of customer service in the food industry. As we were seated, I looked around at the beautifully appointed room, with heavy linens, and lovely tableware, but nothing ostentatious. It felt like I was in someone’s much loved home. There was quiet chat all around us, with people enjoying the food, their friends, and their surroundings. Home. It wasn’t long before John Bishop himself came and joined the three of us for a few minutes at our table. Pulling out the fourth chair he became one of our group. He already new the other two, but I was a new face. He found out we lived on a producing farm, and was instantly interested in all aspects of how we raised our animals, how we sold our meat, and so on. Through the conversation he also learned that I was a caterer. I don’t usually bring this up to “real chefs” as I am untrained, and tend to put chefs on pedestals, of which I will probably never rise to. After no more than 10 minutes, he was off to run his room. We ordered dinner, and enjoyed a small amuse bouche he brought to us. Before we were served our main meal, he came to the table and asked if I would like to come into the kitchens, and see the workings, how it was all set up, and the like. We moved from station to station looking at sauces simmering, meat being expertly trimmed and cooked, all while there was a very professional but happy energy happening. Looking at me with a twinkle in his eye, he asked me to follow him out the back door to the alley, as he wanted to show me something. On the landing of the turn of the stairs, no more than 8 feet square, there was a very homey patio table with an umbrella and 4 or 5 chairs. He was so excited to show me these. One of his best customers had called only to find that the restaurant was fully booked for the night. Not to let her down, he gave her an al fresco option. He’d asked his wife if she would be able to bring their set from their own home (with children helping) to set up a very special dining experience in the alley way for this treasured client. We sat for a few minutes enjoying the late evening sun, while we both spoke of both our standards of customer service and how feeding people had brought us to these points in our lives. As we walked back to the dining room, he asked if I would come and spend three days or so in his kitchen in the near future. I would have loved to, and it was a door I should never have let close. Regrets? Maybe, but at the time I knew my place was on the farm with my family. All these years later, it still remains my favourite room in Vancouver. 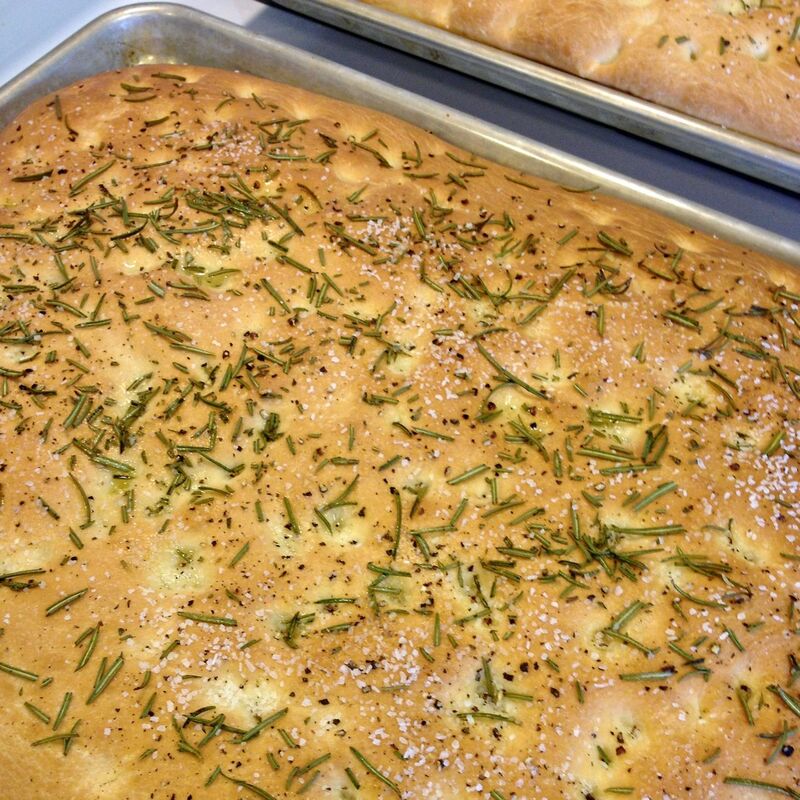 This recipe for focaccia bread is based on a recipe from Bishop’s. Pour the warm water into a stand mixer’s bowl. 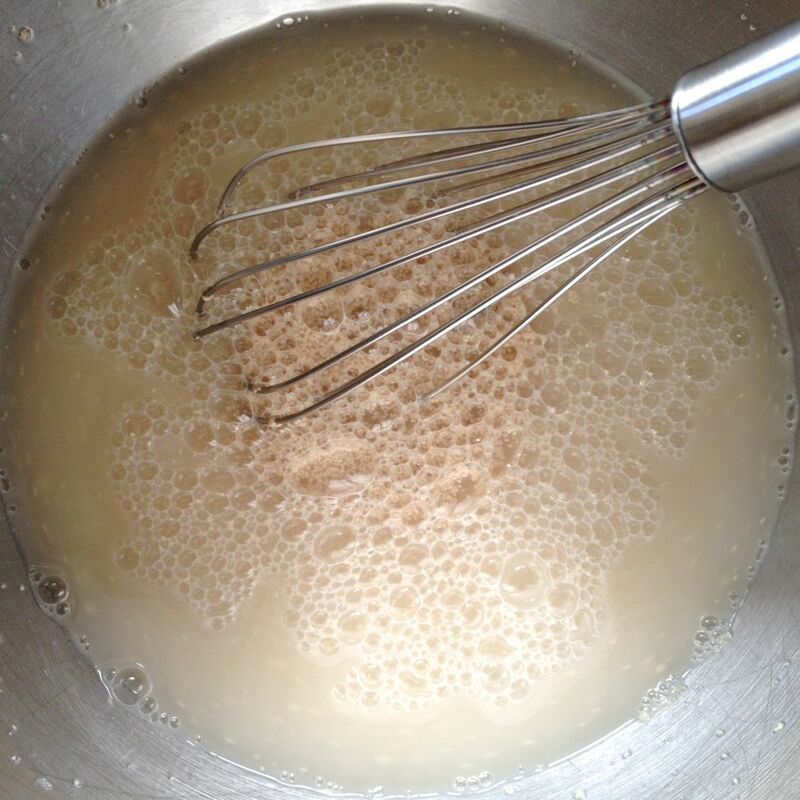 Add in the sugar, and hand whisk until dissolved. 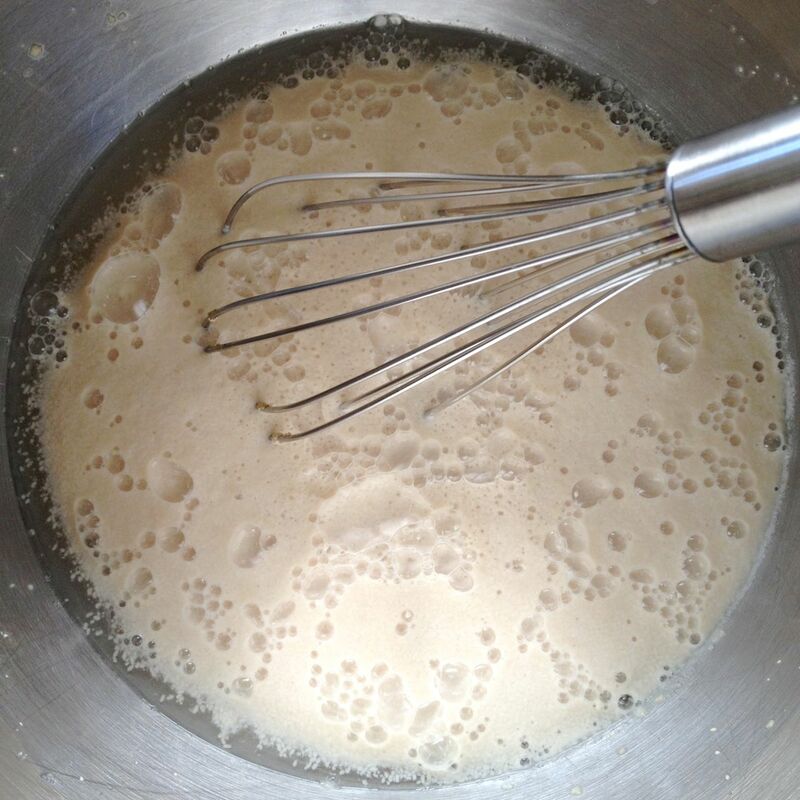 Add in the yeast, and give a few turns of the whisk to distribute. Let proof for 10 minutes. Whisk in 2 cups of flour. 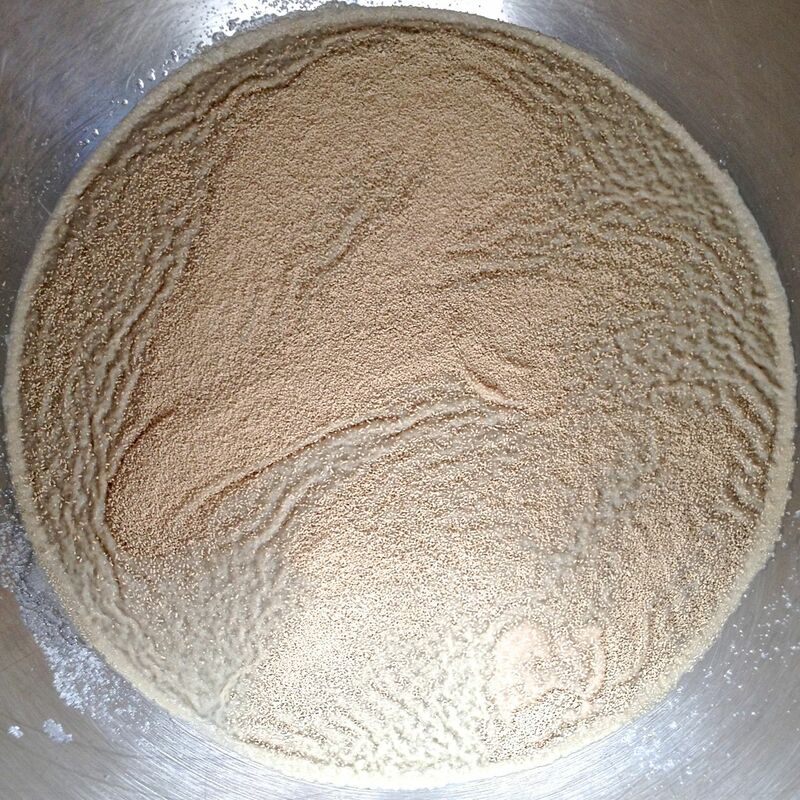 Stir in another cup of flour. 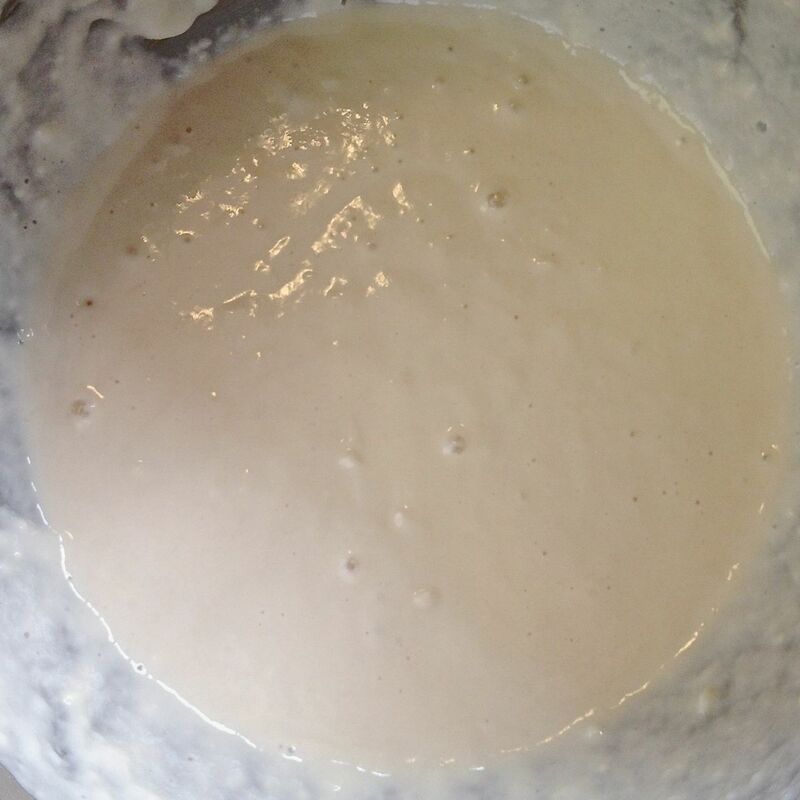 Sprinkle one cup of flour ontop of the yeast & flour mixture. Scatter the salt over top of it, and drizzle on the oil. Stir a couple of times. Set the bowl into the mixer. Using the bread hook, start to knead the bread. 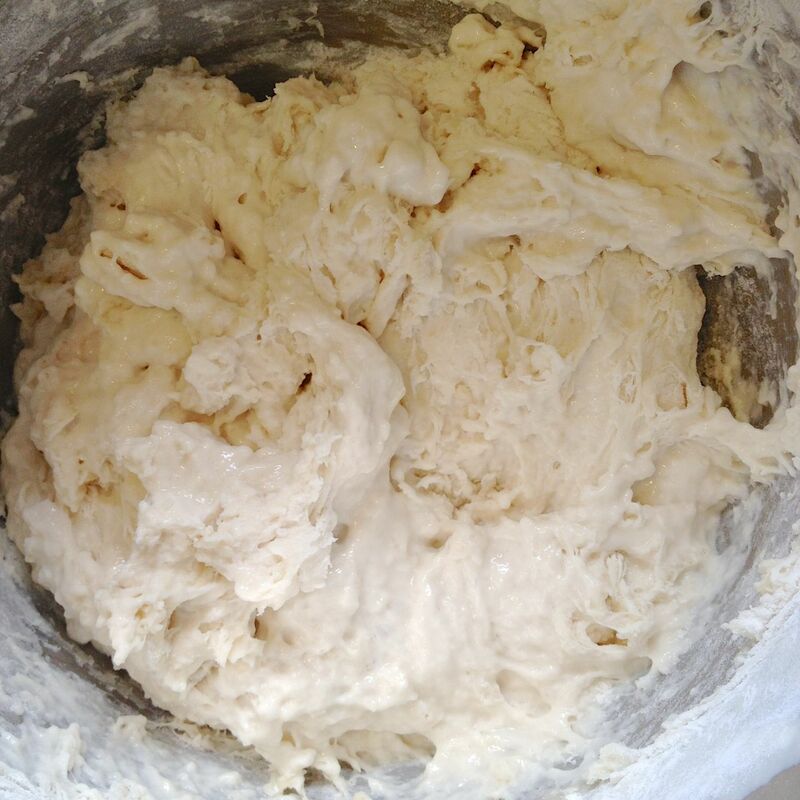 Continue until the dough is uniform. 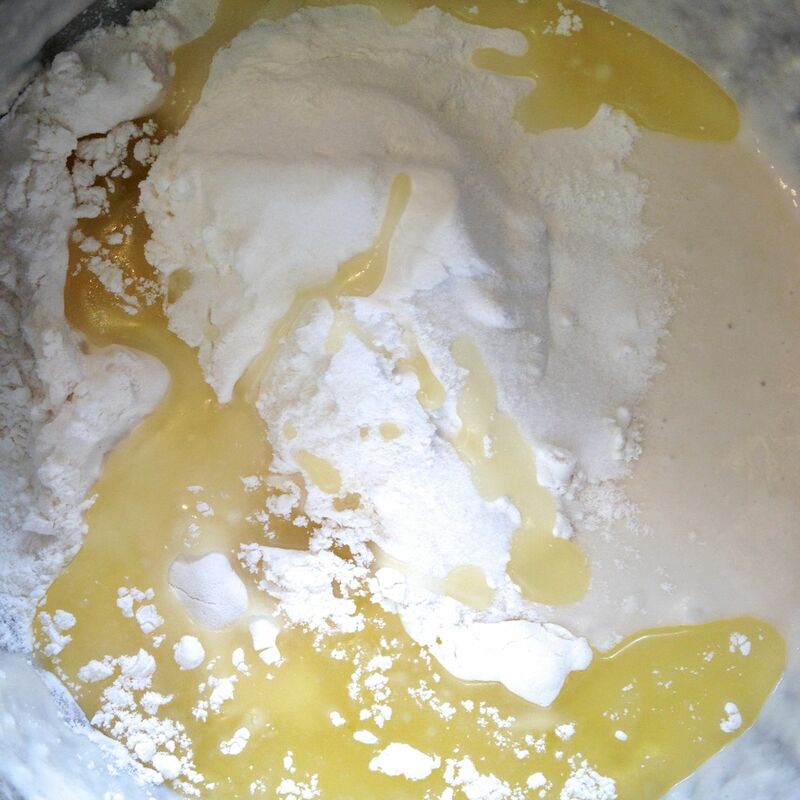 Add in the remaining cup of flour, ¼ c up at a time. Continue kneading until the dough is slightly glossy, and has pulled away from the bowl, and become smooth, 5 minutes or so. 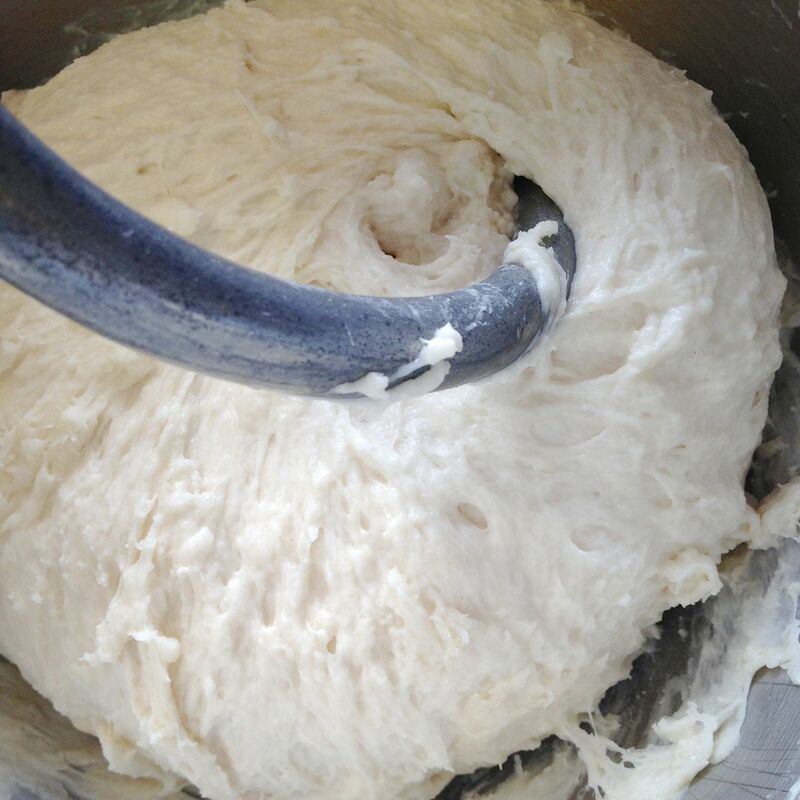 Remove the dough, and place in a greased bowl. Cover with plastic wrap and put in a warm place to rise, for an hour or more. 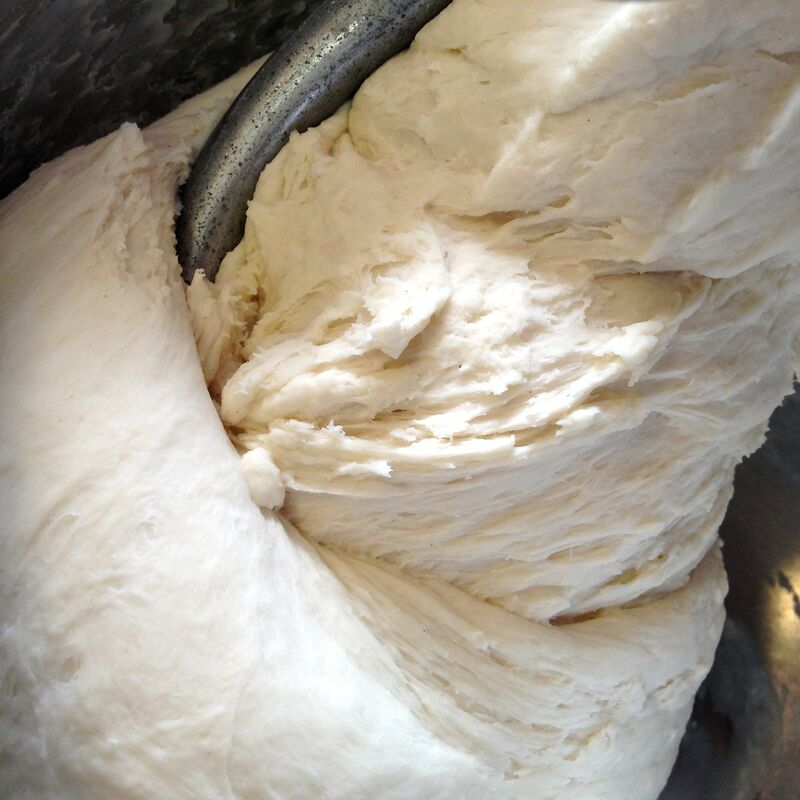 Once the dough has doubled, uncover, and punch the dough down. Let rise another 20 minutes. 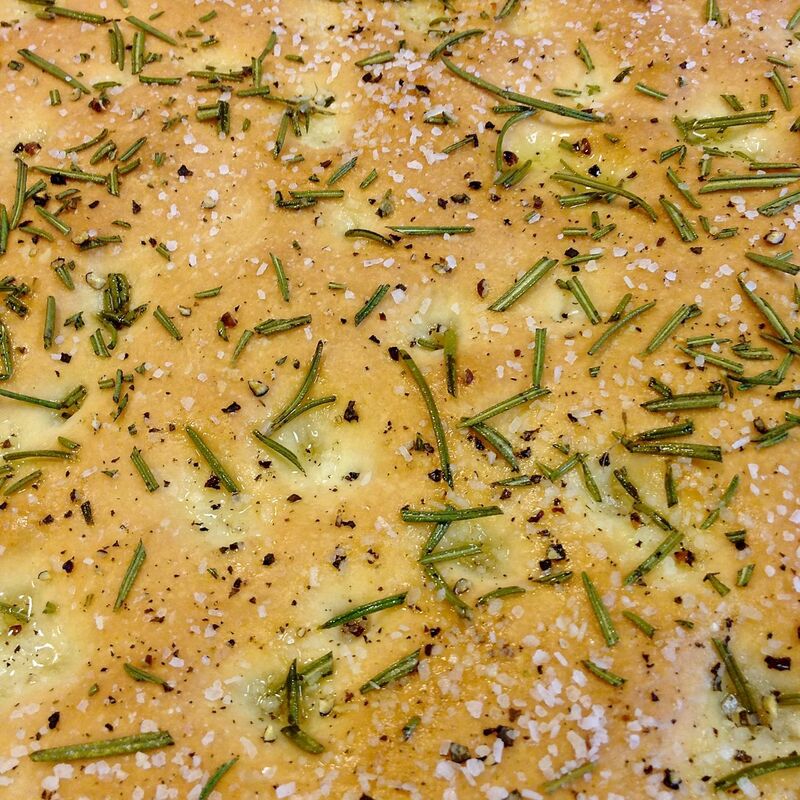 Lightly grease an 11” x 17” baking sheet, and sprinkle with a bit of cornmeal. 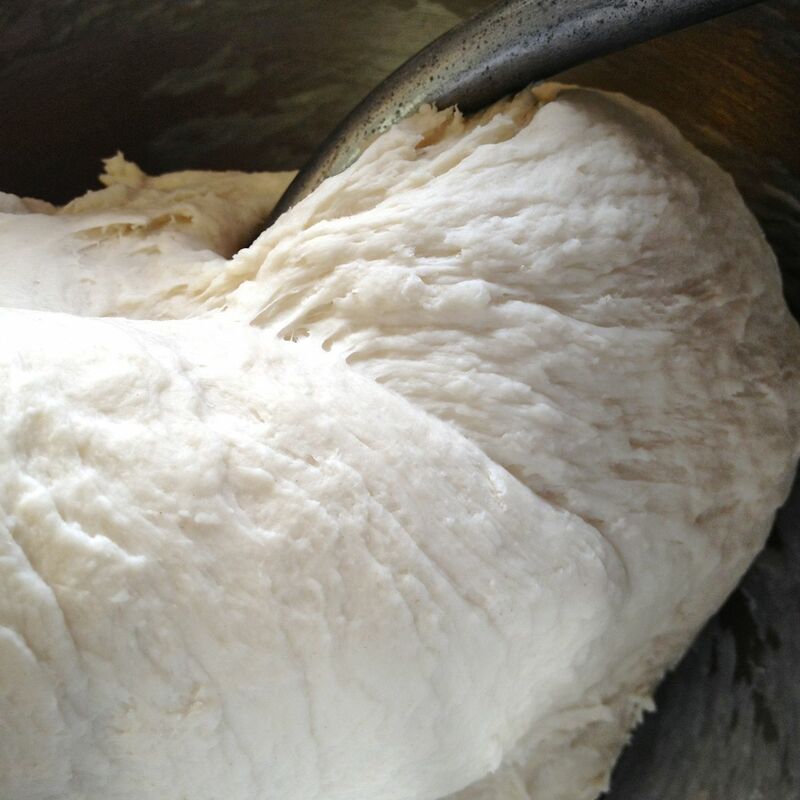 Place the dough on a work surface, and roll out to a uniform thickness to fit the pan. The dough doesn’t need to fit exactly. Cover the dough lightly with plastic wrap and let rise for 30 minutes. When the dough has risen for 30 minutes, take your hands, with fingers pointing down, and dimple the whole of the top of the bread. Brush the dimpled top with olive oil, using about 2 tablespoonfuls. 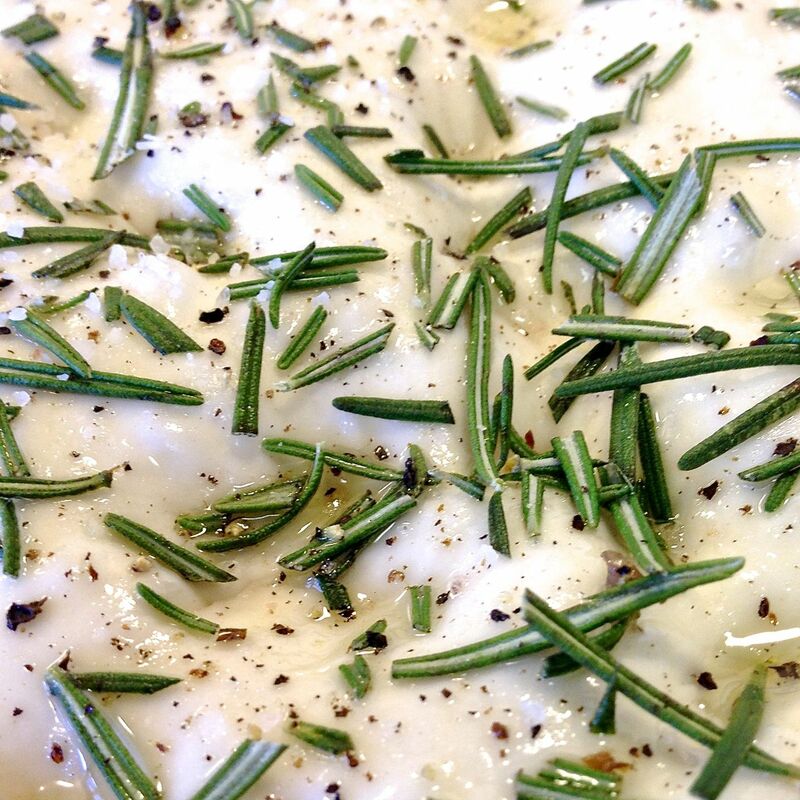 Sprinkle with the chopped rosemary, followed by a liberal sprinkling of salt & pepper. 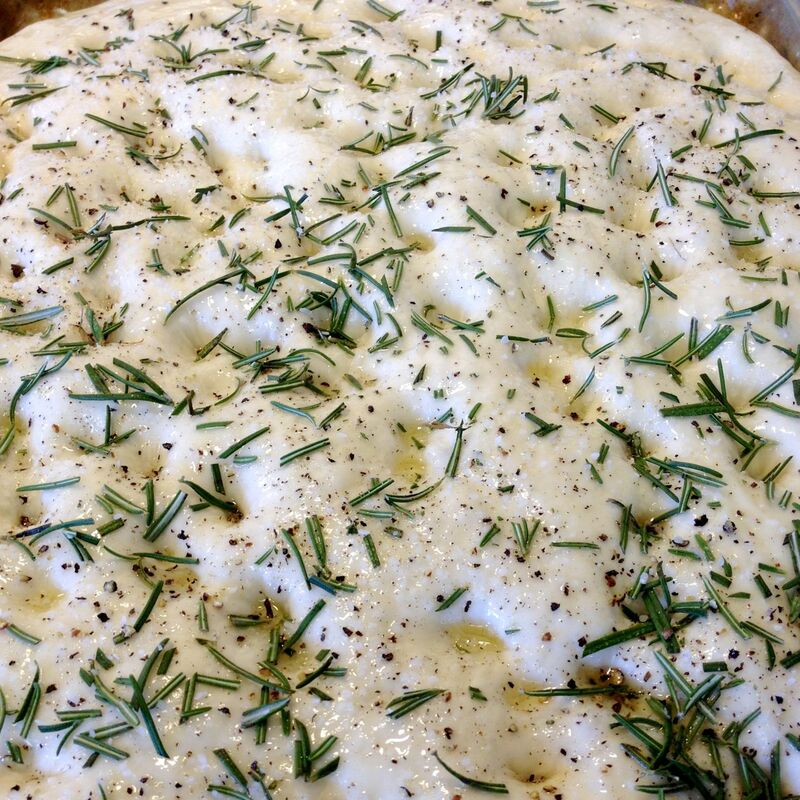 Place in the center of the oven, and bake for 30 minutes. 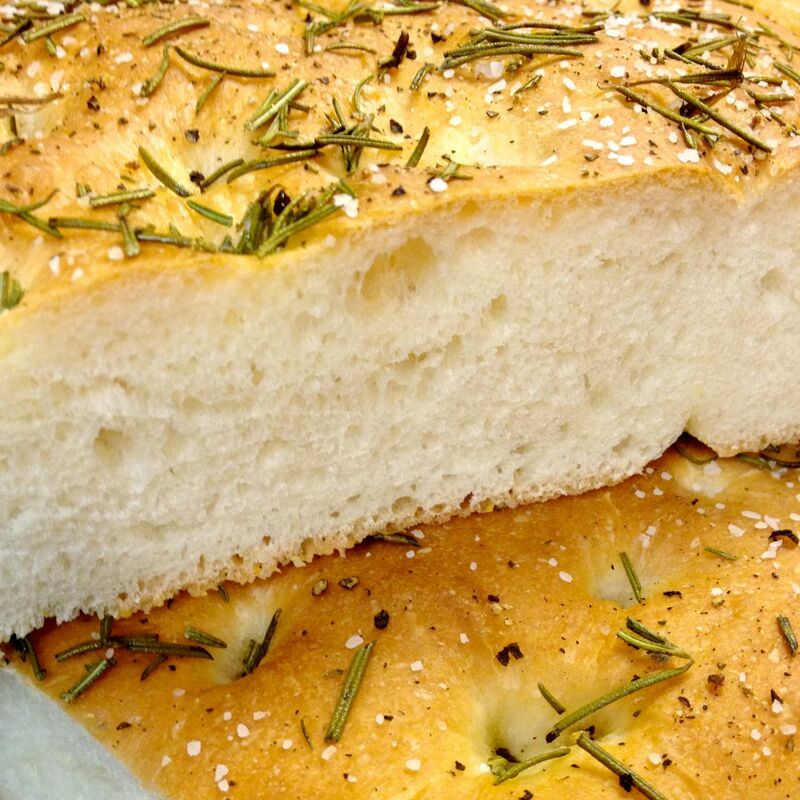 This is a great bread to serve directly with a meal, hot from the oven. 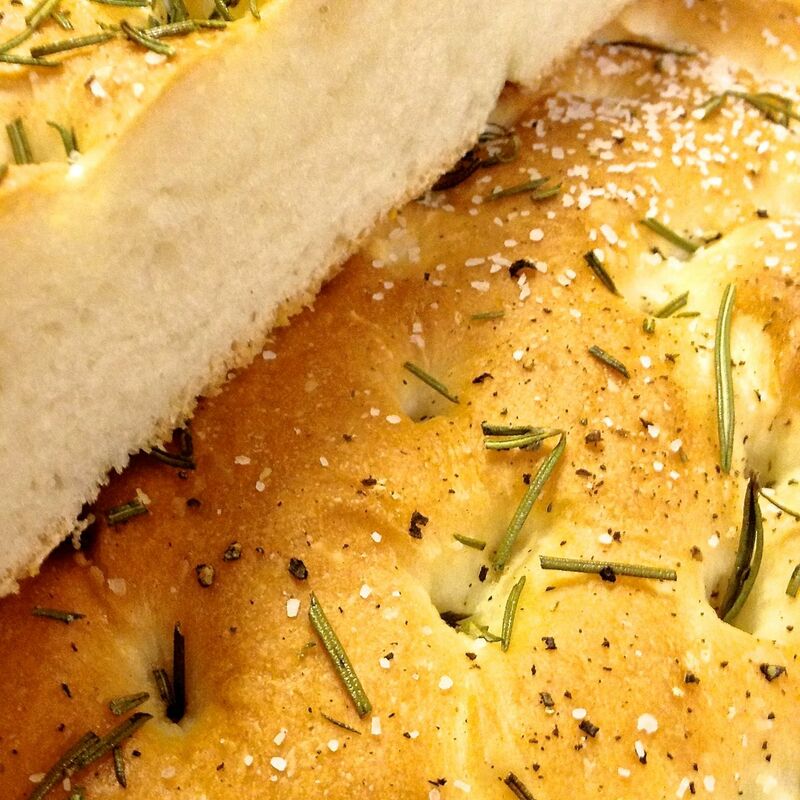 As well, I have used this recipe many times creating a pizza type bread for appetizers. 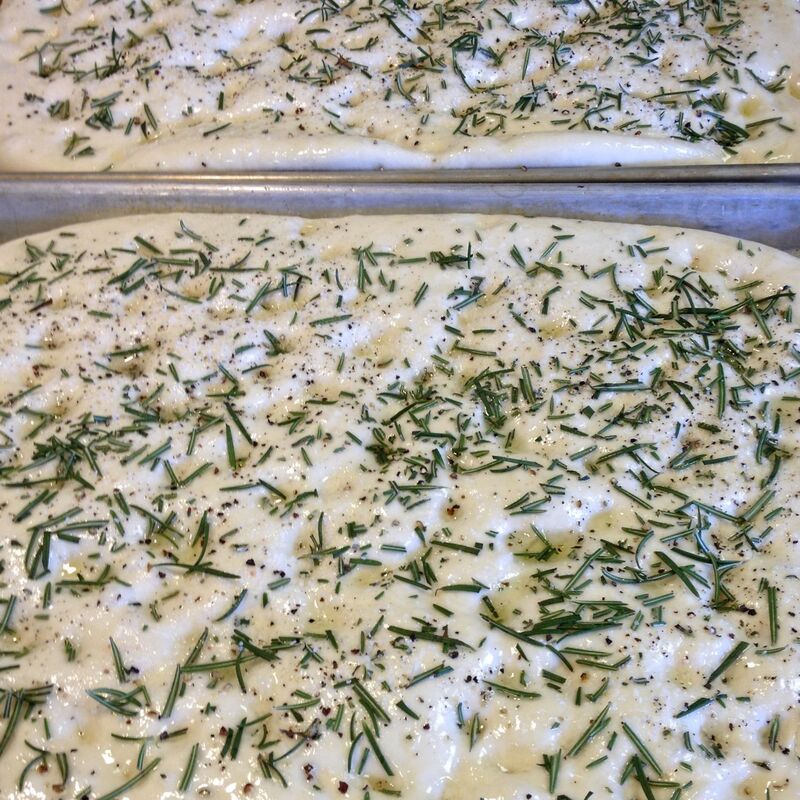 Simply divide the dough between two baking sheets (the finished bread will be thinner), and top with your choice of toppings. Bake at 400° for 30 minutes, or until your toppings are as you want them! This looks lovely, especially the colour. 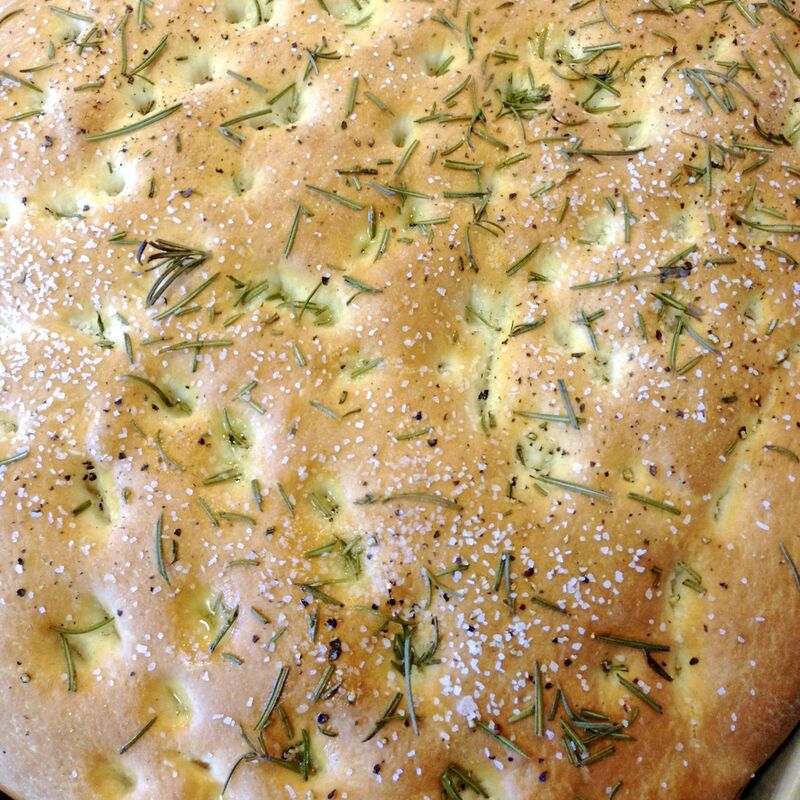 It’s a great bread, soaks up sauces really well.